Address: 1011 Budapest, Apor Péter u. 3. The Carlton Hotel Budapest is situated at the foot of the famous Fishermen's Bastion and the romatic castle quarter, just a few steps away from the city's central business and shopping districts and the Chain Bridge. With its central yet quiet location it offers the very best in modern hotel comfort. 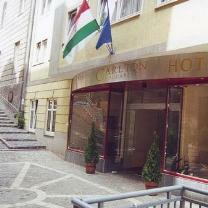 Carlton Hotel Budapest is situated at the foot of the famous Fishermen's Bastion and the romantic Castle District, just a few steps away from the city's central business and shopping districts and the Chain Bridge.